FOR A PAIR OF OVERSIZED GOGGLES THAT HAVE SPROUTED CHUNKY HEADPHONES, IT'S SURPRISINGLY LIGHT. The whole apparatus has all the heft of a soccer ball. There is no dwelling in limbo for long: Don the device and it pulls you, the hero, across reality’s threshold. You were in a tech demo hall, your living room, or, maybe sooner than you think, a classroom – and boom. Now you’re standing in a digital field. Or cruising in outer space. 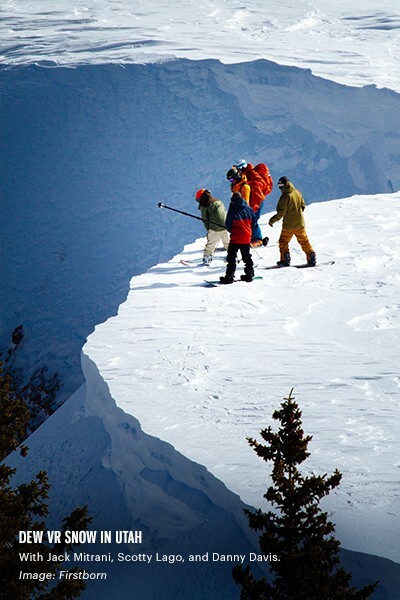 Or snowboarding in Utah's back country with Scotty Lago and Danny Davis. 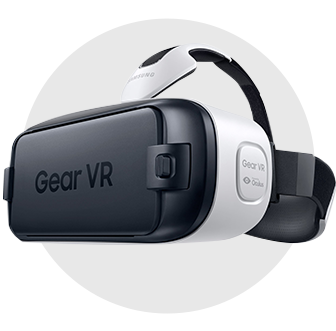 Virtual reality headsets are set to crash into consumer marketplaces in quick succession. 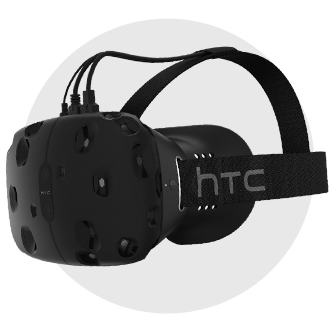 The waves break beginning in late 2015 with Vive, a joint effort from video game developer Valve and smartphone manufacturer HTC. 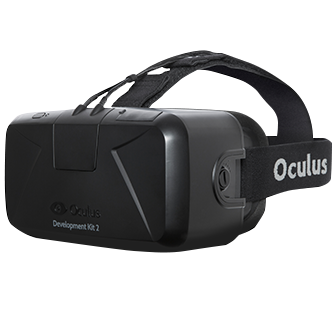 Oculus Rift, that PC headset born in the fires of Kickstarter, is rumored to come in early 2016. Hot on its heels will follow Sony’s Project Morpheus for the PS4. We’re going to get drenched in VR – without, of course, ever getting wet. We have seen virtual reality shoot for the moon before, only to land in a dark, dusty storage room. In the 1990s, bulky VR chairs popped up in theater lobbies and arcades, trying to channel unwieldy headsets, poor motion tracking, and crappy graphics into three minutes of fun. To master the way we have fun, VR’s path will parallel that of 3D films: A niche technology explodes after an early buzz, fades away, and then roars back with a vengeance. Filmmakers basked in a golden era of 3D film 60 years before Avatar, complete with audiences putting on polarized glasses to watch science-fiction films (with perfectly '50s names like It Came from Outer Space). Making pictures leap off a screen has never been cheap, however, and this gilded age was no exception. With costs mounting and interest waning, 3D movies snuck away into the background. There it would lurk, until James Cameron spent $237 million to coax 3D back into the light, with Avatar. Even though early VR couldn’t quite deliver on its immersive promises, it did one thing quite well: cement virtual reality with gaming. When Oculus Rift arrives next year, it will come with a comet’s tail of video games. A sampling of titles announced for Oculus’ launch include space fighting simulator Eve Valkyrie, role-playing dungeon crawler Chronos, and Edge of Nowhere, a survival-action game that doubles as a 3D love letter to Lovecraftian polar exploration. Headsets get us close to unlocking the potential for VR gaming, but they only take us so far. Coming down the pipe are peripherals like Virtuix Omni, a 360-degree treadmill that aims to bake the couch potato gamer stereotype into oblivion. After you tie on Virtuix’s special friction-fighting shoes, moving your gaming avatar means you’ll have to run or walk in real life, too. And if you break a sweat as you hike over the mountains of Skyrim, that’s bonus biological immersion for free. Perhaps treadmills aren’t your style? Try an entire arena dedicated to VR gaming. A startup called The Void takes the best part of laser tag—shooting friends with futuristic, albeit harmless, weapons—and paints it with a glossy coat of augmented reality. The Void’s first gaming centers are set to open in 2016, complete with headsets, tactile gloves, and vests that react when your buddy scores a hit with space missiles or magic fireballs. As developers are creating new games meant to be played with virtual reality headsets and handheld controllers, or adapting old ones like Minecraft to work with the Microsoft Hololens, movie producers aren’t just standing by. Immersive videos offer a way to push past where Avatar left off. Oculus created Story Studio, an attempt to harness VR’s potential for movies. The first video, a short Pixar-esque fable called Lost about a robot hand on the hunt for its body, debuted at Sundance 2015 to early acclaim. Watching Lost, viewers have found themselves crawling on the ground to examine the hyper-detailed ferns, or getting so absorbed in the film they’re surprised loud crashes don’t make the real world vibrate. That next step will come. Beyond animation, VR gives us the best approximation of teleportation humans have yet created. Want to see what it looks like to burn rubber at 100 mph? Mtn Dew did too, so it teamed up with Dale Earnhardt Jr. to create Dew VR Bristol. It’s the third in a series of Mtn Dew Green Label Films VR experiences that include bombing down the Vegas strip with the Dew Skate Team (Dew VR Skate) and shredding Utah’s backcountry with Dew Riders Scotty Lago and Danny Davis (Dew VR Snow). 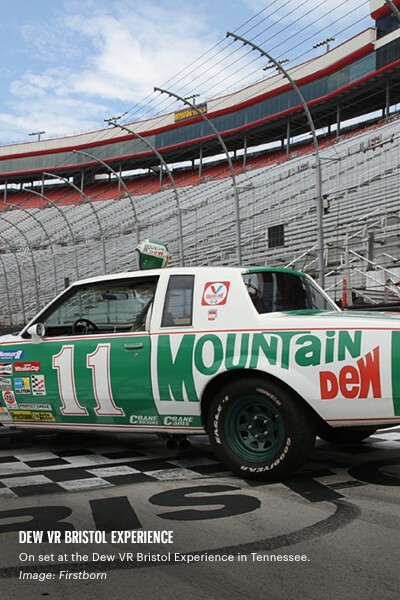 In Bristol, watching as cars cruise through Bristol Motor Speedway is still a spectator sport–but there’s no better vantage than as a passenger in Earnhardt’s vintage Chevrolet, thanks to the six cameras offering a 360-degree view. Announced in September at Oculus’ Connect, the Gear VR is a joint venture between Samsung and Oculus. It doesn’t require a computer connection, just a Galaxy S6 or other recent Samsung smartphone slotted into the front. It will cost $99 and comes out on Black Friday in November 2015. There will be plenty of games to keep you and your eyes entertained, including old-school gems like Pac Man and Sonic, as well as all of Dew’s VR Experiences, including Skate, Drive, and Snow. The Oculus Rift, the elephant at the head of the virtual reality stampede, launched with an explosive Kickstarter in 2012. Oculus has released two developer kits already, and expect the consumer version of the Rift by the end of March 2016. It will be a sight to behold: Each eye feasting on a 1080 by 1200 pixel view and 90 Hz refresh rate. You’ll need a fairly beefy computer to run the Rift, though Dell, Asus and Alienware recently announced they’ll be creating a line of Oculus-ready PCs around the $1,000 price point. The cost of the Rift itself? There’s no definitive answer yet, but probably on the higher side of $350. Microsoft’s take on VR is, more properly, augmented reality. Rather than showing you a complete fiction shuttered behind a pair of goggles, the Hololens blends 3D digital images with real world surfaces. Microsoft will make the Hololens available to outside developers and engineers in 2016, the company says, but we’ll have to wait a bit longer for a public-facing version. 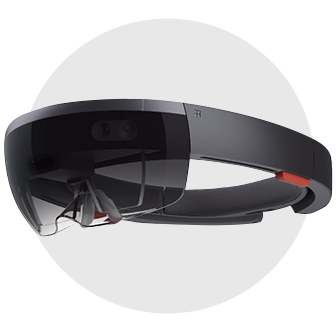 When it arrives, expect the Hololens to cost more than a new video game console. 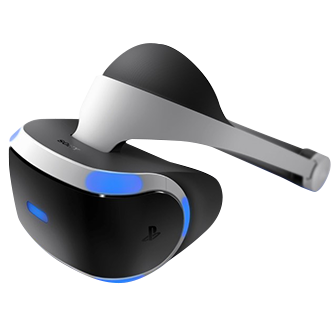 The headset formerly known as Project Morpheus, PlayStation VR brings virtual reality to the PS4. Like the Rift, it’s coming in 2016 (though at a vaguer first half of the year) and has a 1080 pixel display. Just as Facebook has grand plans for social VR with Oculus, Sony wants multiplayer to be a big part of PlayStation VR. But this device will be singularly optimized for gaming—at least 10 games at launch, including Final Fantasy XIV and Eve: Valkyrie. You’ll need a PS4, of course, and you might have to drop about the same amount of cash on the headset hardware itself, too. Valve Corporation, makers of video games like Half-Life and operators of the Steam game platform, teamed up with smartphone maker HTC to get into the VR game, and created the HTC Vive. It’s got similar visual specifications to the PlayStation VR and Rift, though there are a few differences in controls (the Rift will sport a touch-based system, Vive has a scroll and click gamepad). Like the other headsets, there’s no concrete price announced yet, though it’s hinted to cost a little more than the Rift. We could see a Vive on the market as soon as December 2015; in anticipation, Steam has been curating HTC Vive compatible games, currently boasting a few dozen recommendations. What seems like an April Fool’s gag is surprisingly effective at transforming a smartphone into a VR experience, taking advantage of a phone’s gyroscope to track where your head moves. 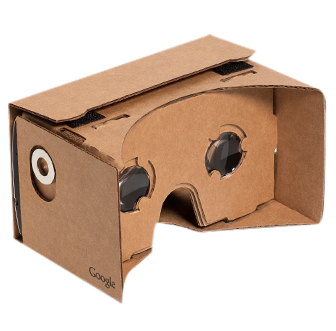 It’s not as immersive as the other devices mentioned, but Google Cardboard -- as its name might suggest -- is cheap: About $30 for the classic corrugated-brown design. It’s available now, and you can use it to take virtual field trips through Google Expeditions or watch 360-degree videos on YouTube. To the VR enthusiast of the future, no activity is too personal or too mundane that it couldn’t be enhanced with a headset. Take shopping, for instance. A handful of apps already offer augmented reality avatars to see just how well your favorite jeans pair with new sneakers. Pushing this idea a step further, in June the New York-based fashion store The Line created a virtual copy of its Manhattan boutique for French shoppers. During a visit to a virtual store, your size will always be on the rack and they’ll always have your color. Since you can try things on at home, you might just never have to step in a mall again. Plus, you won’t have to wander this digital wonderland alone. There’s a reason that Facebook shelled out $2 billion for Oculus Rift in 2014: On our post-smartphone planet, virtual reality is the next great candidate for a new social media platform. Early VR games will take advantage of what Red Storm creative developer David Votypka calls "social presence," the idea that player interaction—as simple as seeing where someone is looking at a game board to the more complex cues of bluffing—is enhanced via VR. But these are simply the start. Legendary science fiction author Neal Stephenson predicted a sort of massive open-world virtual reality called the Metaverse in his 1992 novel Snow Crash – and now he’s helping make that closer to real life. In late 2014, right after he joined VR pioneer Magic Leap, Stephenson said VR’s potential goes beyond gaming; such technology, he believes, will become as commonplace in society as cell phones. Social VR will look less like hordes duking it out in World of Warcraft and closer to a blown-up version of The Sims. Is your best friend abroad for the semester but you’d love to sit down for a cup of coffee? Do it virtually. Future iterations of Hangouts, Facetime, and Skype won’t simply let you scribble moustaches on each other. Sure, you’ll likely be able to draw 3D beards on your friends, but more importantly virtual lounges could borrow the appearance of any environment you’d like. Today, for instance, Harvard University Egyptology expert Peter Der Manuelian can take you through the Pyramids of Giza. As software like this finds its way into classrooms, too, there’s no reason to even stay on Earth. You could take an educational jaunt through the solar system without getting up from your desk. (A few Oculus developers are trying to create game-like experiences that do just that.) And on this class trip, you have hundreds of real-time classmates, and your guide is the best Mars expert around. Let’s not forget the romantics. Schedule a date with that cute nerd you met near Olympus Mons for a 3D walking tour of Narnia or the Batcave or Xavier’s School for Gifted Youngsters. If someone could dream it up, so the thinking goes, you could go there. Before we plunge into full simulated realities, there are a few humps to get over. Right now, most VR environments are best traversed via joystick controls, with the user sitting or standing in one place. It’s no coincidence that the best immersive experiences to date involve piloting spacecraft or riding shotgun in race cars—you’ll naturally want to be seated for these. Motion sickness, too, is famously a problem that arises thanks to the disconnection between what your eyes see (movement) and your inner ear senses (stillness). Developers have started to incorporate graphic solutions, and there have been clever attempts to add actual movement, like the Virtuix. Headsets will take you there, but other peripherals will give you all the feels. For now feel free to sit down and enjoy the ride.